Pay-Per-Virtual Reality could become a thing thanks to AltspaceVR. The VR chat room and communication platform just raised $10.3 million to give us a digital place where we can hang out. But with this funding, which brings AltspaceVR to $15.7 million, comes a need to devise a business plan. While AltspaceVR is focused on growth now, its co-founder and CEO Eric Romo tells me it could eventually monetize by selling admission to virtual gatherings featuring celebrities or thought leaders. 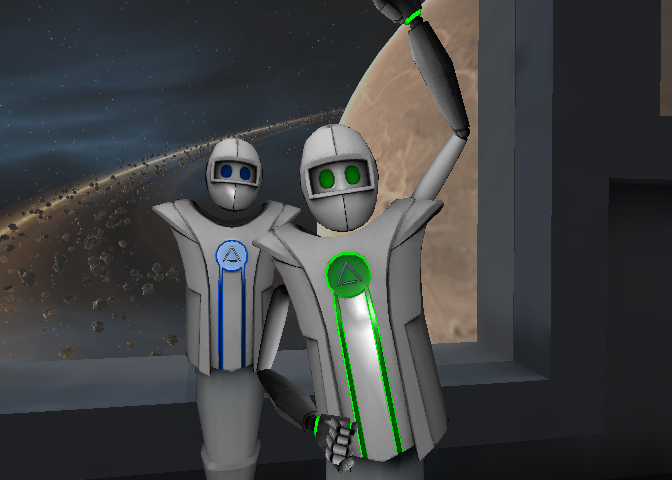 Founded in 2013, AltspaceVR officially launched its VR chat room platform in June following months of testing. There, strangers from across the world appear as robot avatars that can talk to each other, browse the web, play oversized board games, or watch videos on a massive digital screen. The software is designed to run on Oculus, Mac and PC desktops, and 3D TV, and can be equipped with a Leap Motion or Kinect motion sensor to bring users’ gestures into the virtual world. Romo tells me “one of the things investors were excited about was a 25 minute average user session time.” Most VR experiences today are quick, one-off games or cinema experiences that last just three to five minutes. Their novelty quickly dries up. But since AltspaceVR is populated with other real people, it doesn’t get boring or repetitive the same way. The new funding comes from Comcast Ventures, as well as returning investors Tencent, Dolby Family Ventures, Raine Ventures Lux Capital, Western Technology Investments, Maven Ventures, Promus Ventures, Streamlined Ventures and Rothenberg Ventures. So far, live events have been some of AltspaceVR’s most popular moments. For example, a scientist who’d visited a massive volcano crater and captured it in virtual reality with the help of drones led a tour. Dozens of Altspacers followed along as he led them through the volcano — a place they’d probably never get to visit, especially without protective gear. Some people reported the experience to be one of the best things they’d ever done, VR or IRL. Romo says players stayed in Altspace playing these games for as long as 3.5 hours straight. That’s a bit unsettling as a sign of humanity’s future and the potential for VR addiction, but it sure bodes well for AltspaceVR. For now these events are free, but with enough draw, AltspaceVR could potentially charge the same way people pay to watch a boxing match on TV or attend a webinar. Today, comedian Louis C.K. sells videos of his performances from his website. But eventually, he might be able to draw a crowd to watch him live over virtual reality. it’s the dream of these shared experiences, and the faux face-to-face encounters delivered by AltspaceVR, that convinced Mark Zuckerberg to buy Oculus. AltspaceVR started before that happened, and before many believed virtual reality would ever truly materialize. Two years later, and social VR isn’t just make-believe any more.